The purpose of this task is to match three resources to each other: the Thesaurus of the Netherlands Institute for Sound and Vision (called GTAA), the New York Times subject headings and DBpedia. The rationale of such a mapping is to open up and connect large collections of data all around the world. Archives, museums and libraries use controlled vocabularies to disclose their collections. Linking these vocabularies to each other, regardless of their language, is a first step towards search and browsing accross collections. Links to other sources of knowledge on the Linked Data Web (such as DBpedia) not only enrich the collections with additional information, but can also serve as hubs that connect multiple collections. This task focuses on Dutch and English sources. The mapping between the GTAA and the New York Times subject headings enables a cross-language (NL/EN) and cross-media (television/news paper) integration of the two collections. We are aiming for skos:exactMatch relations. According to the SKOS recommendation, a skos:exactMatch link "indicates a high degree of confidence that two concepts can be used interchangeably across a wide range of information retrieval applications". We focus on this relation because our task aims at enabling/enhancing search and browsing through interlinked archives. Fax the signed Non-Disclosure Agreement to +31 15 2786632, at the attention of Laura Hollink, or scan the form and e-mail it to l.hollink at tudelft dot nl. If a person is searching the TV archives of The Netherlands Institute for Sound and Vision for programs about Cormorants, the mapping between the GTAA and DBpedia gives this user access to information about the genre, species, synonyms, the wikipedia page and other documents about Cormorants. A Dutch person interested in TV programs about exhibitions of Mondrain's painting is very likely to be interested in New York Times new articles reporting on the same exhibition (and is very likely to be able to read the material in English too). We will evaluate all mappings with this general application scenario in mind: enabling/enhancing search and browsing through interlinked archives. The three resources that we consider are large, and consist mostly of instances; whereas DBpedia is organized according to multiple hierarchies or categorizations, GTAA and the New York Times subject headings are (mostly) flat resources. Whereas DBpedia has labels, abstracts and comments in different languages, GTAA and New York Times subject headings are both monolingual (the former in Dutch, the latter in English). The proposed task can be schematized as in the picture above: a triangular cross-language instance mapping. The New York Times has developed over the past 150 years an authoritative vocabulary for annotating news items. The vocabulary contains about 30.000 subject headings, or tags. They are in the process of publishing them as Linked Open Data and by July 2010 had published over 10.000 of these subject headings in the categories People, Organizations, Locations and Descriptors. We use this dataset for the VLCR task. Note that the Descriptors facet is similar in content to the Subject facet of the GTAA. For further information about the New York Times data we refer to their website on Linked Data Documents. The SKOS representation of each subject heading facet contains the label of the skos:Concept (skos:label), the facet it belongs to (skos:inScheme), and some specific properties: nyt:associated_article_count for the number of NYT articles the concept is associated with and nyt:topicPage pointing to the topic page (in HTML) gathering different information published on the subject. The concepts have links to DBpedia, Freebase and/or GeoNames. Participants of VLCR are not allowed to use the existing links to DBpedia, as the task is meant to map previously unmapped vocabularies to each other. The Location facet also contains geo-coordinates. Although the official datasets can be freely downloaded from http://data.nytimes.com, we created a local copy to make sure that all VLCR participants work with the same set: the New York Times' website can be updated at any time, and a local copy avoids running into versioning problems. Existing links to DBpedia have been removed from the local copies. The files for the task can be found above. DBPedia is an extremely rich dataset. It contains 2.18 million resources or "things", each tied to an article in the English language Wikipedia. The "things" are described by titles and abstracts in English and often also in Dutch. 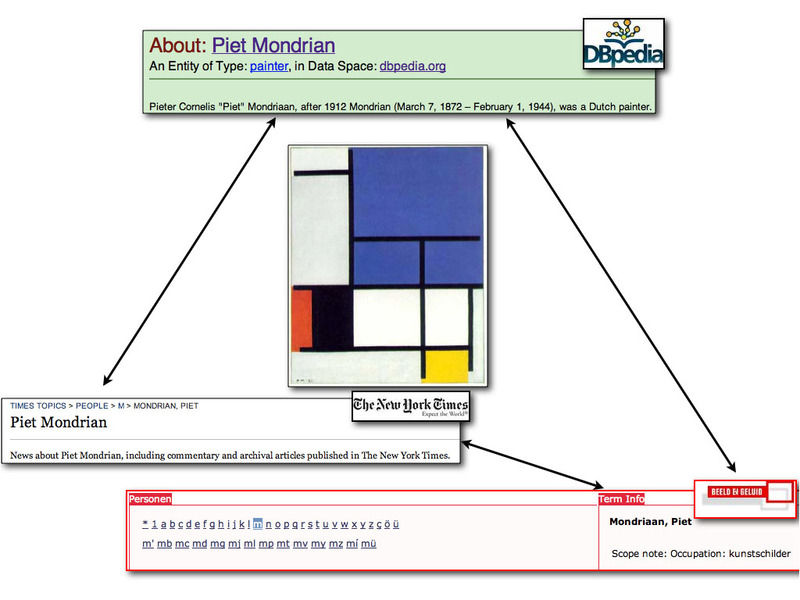 DBPedia "things" have numerous properties, such as categories, properties derived from the wikipedia 'infoboxes', links between pages within and outside wikipedia, etc. The purpose of this task is to map the DBPedia "things" to NYT subjects and GTAA concepts. All information can be downloaded from the DBPedia download site. For each type of property (title, abstracts, infobox properties, links to pages, etc. ), there is a separate file that can be downloaded. Also, small preview files are provided. In the following description we will link to the preview files instead of to the actual content files that you need for the allignment, to prevent multiple downloads of very large files. -- rdfs:label -- "title of the wikipedia page"
-- rdfs:comment -- "abstract of the wikipedia page"
The file Titles (preview) contains labels, available in English and Dutch, which are the titles of the corresponding wikipedia articles. The file Short Abstracts (preview) contains short abstracts, available in English and Dutch. In addition, we consider the DBpedia ontology and DBpedia categories valuable sources for the current alignment task. Descriptions will be given below. The DBpedia Ontology is an ontology of currently more than 259 classes, organised in a subsumption hierarchy. The ontology was manually created based on the most commonly used infoboxes of Wikipedia. 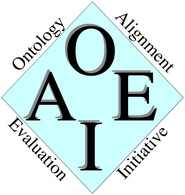 The file DBpedia Ontology (preview) contains the classes and properties of this ontology, while the file Ontology Infobox Types (preview) contains the instances of the Ontology, i.e. DBpedia "things". DBpedia "things" are organised into categories. The file Categories (SKOS) (preview) provides the categories and the SKOS relations between them, while the file Articles Categories (preview) contains the skos:Subject links between "things" and categories. All DBpedia files are in RDF, and some are in SKOS. The GTAA contains approximately 160.000 terms: ~3800 Subjects, ~97.000 Persons, ~27.000 Names, ~14.000 Locations, 113 Genres and ~18.000 Makers, and is continually updated as new concepts emerge on TV. In this mapping task, we consider only the four following facets: Subject, Person, Name and Location. The SKOS version of the GTAA consists of skos:Concepts with Preferred and Alternative labels, related by skos:broader, skos:narrower and skos:related properties. In addition, some concepts are clarified with a skos:scopeNote. Terms in all facets of the GTAA can have Related Terms and Scope Notes, but only the Subject facet has Alternative Labels and Broader Term/Narrower Term relations, the latter organizing the terms into a hierarchy. The hierarchal organisation of the Subject facet is not very dense: 80% of the terms are not involved in hierarchies deeper than 3 levels; the average hierarchy depth is 1.3. Samples of the datasets are directly available for inspection from Person, Name, Location, Subject, and below are examples from each facet. Each facet is in a different file, but all concepts have a skos:inScheme property that specifies the name of the facet that it belongs to, enabling you to put all the data in only one file if necessary. The Netherlands Institute for Sound and Vision is currenlty in the process of publishing the GTAA as linked data. However, for the purpose of this mapping task we provide a stable SKOS version of the four relevant facets, that represents the GTAA as it was in 2009. The GTAA is copyrighted material. To obtain the full datasets, please download the user agreement here. Fax the signed agreement to +31 15 2786632, at the attention of Laura Hollink, or scan the form and e-mail it to l.hollink at tudelft dot nl. You will receive by email the password to access the complete dataset. We evaluate the results of the three alignments (GTAA-NYT, GTAA-DBpedia, NYT-DBpedia) in terms of precision and recall. Aside from an overall measure, we also present measures for each GTAA/NYT facet separately. For precision, we will judge samples of each allignment as being correct or incorrect, and re-use judgements made for the VLCR task in 2009 where applicable. For recall, we will create gold standards for random samples of each GTAA/NYT facet, and re-use gold standards that were made for the VLCR task in 2009 where applicable. All judgements will be made with our application scenario in mind: enabling/enhancing search and browsing through interlinked archives. final results ready and OM-2010 workshop. We would like to thanks Evan Sandhaus from the NYT for the fruitful collaboration. We thank Chris Bizer, Fabian Suchanec and Jens Lehman for their help with the DBPedia dataset. We gratefully acknowledge the Dutch Institute for Sound and Vision for allowing us to use the GTAA.